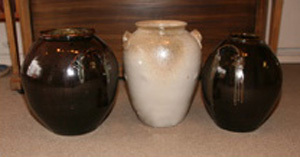 Each Spring and Fall, Rising Sun Pottery hosts a Saturday raku firing. 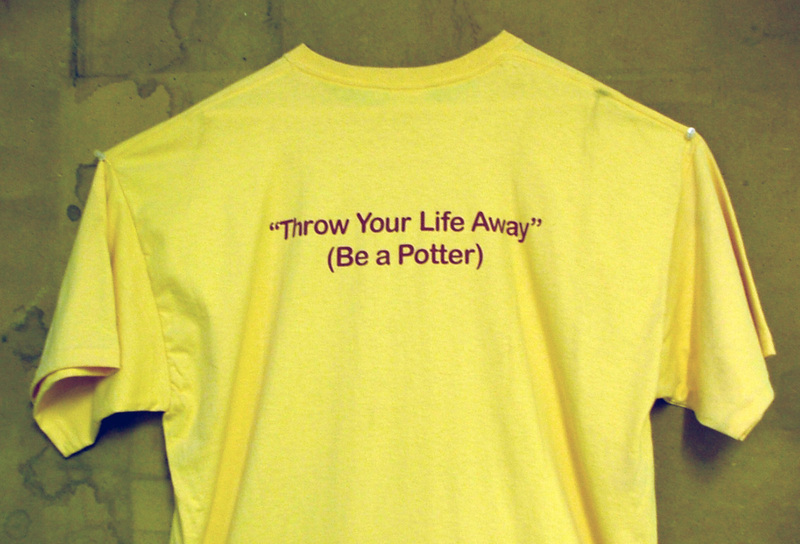 All students and area potters are invited. Everyone brings their pots and if there are enough potters attending, we have a pot luck lunch with Rising Sun providing the burgers and drinks. Otherwise, we "pizza" in! 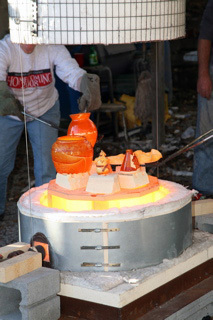 Fun is had by all as we make a day of raku, good food, and socializing. Our Spring Raku Saturday will be held on Saturday, May 12, 2018, and the Fall Raku Saturday is scheduled for Saturday, October 13, 2018. Both events start at 11 AM. Everyone is invited, so start making pots now for a day of fun, fire and smoke. For 2018, our 21st Annual "it was a dark and stormy night pottery guild" workshop will be held Monday, July 1 through Sunday, July 7, 2018. Cost is $455.00 and includes lodging, meals, and all fees. Our 2018 guest instructor has not been determined. Check back or call us for updates and space availability. The September workshop is a true retreat for potters who are looking for a week away from the everyday distractions at home. Gary offers instruction to improve any weak areas you may have and for you to learn new methods in throwing. Or if you are just looking for a workshop to "throw your life away" for a week in the beautiful setting of the North Carolina mountains, this is your chance. There will be a gas cone 10 firing and raku firings available during the week along with instruction how to fire these kilns. Our 2018 7th Annual Fall meeting of the "it was a dark & stormy night pottery guild" will be held Monday, September 3 through Sunday, September 9, 2018. Cost will be $450.00 which includes meals, lodging, firing fees and instruction. Call or e-mail for space availability. This workshop is limited to 14 attendees. Rising Sun Pottery also helps organize potters who wish to attend the Wildacres annual Spring and Fall Artist Gatherings. In addition, Gary manages the studio during this week, so if you need help with anything, it is available. There is cone 10 gas firings, sagger firings and Raku firing during these weeks. This event gives potters the experience of socializing with artists from other media fields: painters, jewelry makers, nature printers, and writers to name a few. The 2018 Spring Artist Gathering at Wildacres will be Monday, April 16 through Sunday, April 22, 2018. The Wildacres Retreat Fall Artist Gathering date is Saturday, October 29 through Sunday, November 4, 2018. Please visit Wildacres.org for 2018 application, deposit deadlines and costs, which include lodging (double occupancy), meals, gratuities, firing fees and other mountaintop activities during the week. Artists of any medium are welcome, including potters, painters, quilters, jewelry making, nature printing, writing, musicians, etc. a day during your stay. In addition, take time to enjoy the Wildacres experience by taking advantage of the many quiet places, fabulous views, and the many hiking trails located on the property. Wildacres is on top of a mountain, so there is not much to do except what you are there for. No TV, radio, newspapers and sparse cell phone coverage minimize distractions. If you wish, take a half-day "road trip" to a local pottery studio or visit Penland Craft School, which is only 30 minutes away. the next "BIG" pots workshop. The 21st Annual Empty Bowl benefit for Hospice Palliative Care of Lincoln County will be held Tuesday, October 9, 2018 at 5 p.m..Our 20th Annual Benefit held in October 2017 was an overwhelming success. We sold out of 326 bowls in about 1-1/2 hours and took pre-paid orders for 29 more bowls! What a great outpouring of support from our community for Hospice in Lincoln County. 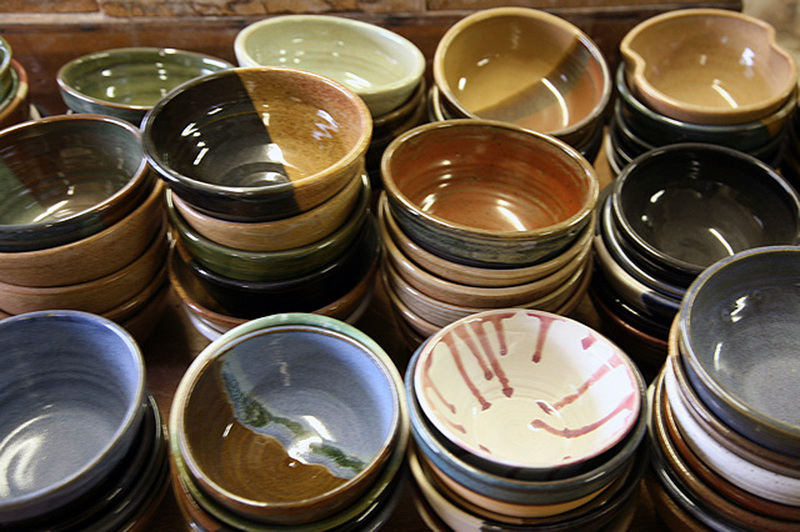 The bowls are made by RSP students and instructors. Rising Sun volunteers make wonderful soups in-house and they, along with RSP students and Hospice volunteers, donate delicious desserts and hours of their time. 75% of the gross proceeds will benefit Hospice Palliative Care of Lincoln County in 2018.